Running Press Kids, 9780762462971, 40pp. Maximillian Villainous is a monster who doesn't have the heart to be a villain. His famous family pulls pranks on the likes of Santa Claus and the Tooth Fairy, and Max spends his time undoing them. So when he brings home a bunny to be his sidekick, Max's disapproving mother hatches a plan. She challenges Max and the bunny to become a devious duo; otherwise . . . the bunny hops. If they want to stay together, Max and the bunny have no choice but to go against their nature. They blunder into villainy with comical effect until Max discovers that embracing his good heart may just be the key to pulling off the most devious deed of all and winning his family's acceptance. Delightfully fun and irreverent, Maximillian Villainous is an empowering story about embracing one's true self and finding acceptance. Up and coming illustrator Lesley Breen Withrow brings the characters to life with bold and colorful illustrations in a style reminiscent of Richard Scarry. 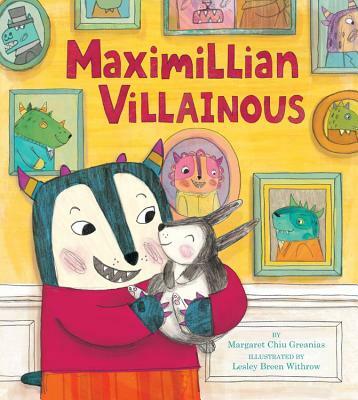 Margaret Greanias was inspired by her children's love of the Despicable Me movies and all things Minion when writing Maximillian Villainous, her debut picture book. She lives with her husband, three children, and a fluffle of dust bunnies in the San Francisco Bay area. Lesley Breen Withrow is the illustrator of several picture books, including You're My Boo by Kate Dopirak and Bunny Bus by Ammi-Joan Paquette. Her artwork can also be seen on many products, including stationery collections and children's games, toys, and apps. Lesley lives on beautiful Cape Cod with her family, a couple of crazy cats, and her daughters' large and ever-growing collection of stuffed animals.